Heimskr is a Nord priest of Talos in Whiterun. He can usually be found in the Wind District, in front of the shrine of Talos. Heimskr spends his days delivering loud, passionate sermons on Talos and his relationship to the Nordic race. His prominent placement in the town—on the main path to Dragonsreach—and his style of speech make him almost impossible to overlook. Heimskr will start his preaching at the shrine of Talos at 5am. He preaches for a total of fifteen hours and finally stops at 8pm. He then heads back home to sleep for four hours until midnight. 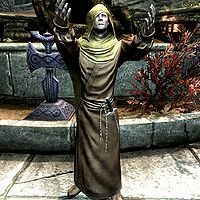 Heimskr wears hooded monk robes and a pair of boots. He is equipped with an iron dagger, and carries a key to his house, as well as a selection of upper-class loot and gold. When you approach him for conversation, he will greet you with things like: "You have come! You have come to hear the word of Talos! ", "The truth, child of Talos, is that the Dragon's children have come! To purge the world in fire and righteousness! ", "There are those who would silence the Dragon's truth! But not I! Not Heimskr! His word will be known! ", "He has returned... Oh, how Talos has returned. Helgen has been purged in his light. Will Whiterun be next? ", and "The Imperials silence us because they fear us! They are cowards! Cowards and fools who have forgotten the truth!" Ending conversation with him will have him say either: "May Talos guide you. Always." or "Stay vigilant! Our enemies are legion!" Should you ask him what he can tell you about Talos, he will reply, "Hello, my friend! If you seek knowledge about mighty Talos, you have most certainly come to the right person." He will then go on to elaborate on the Ninth Divine: "In mortal life, Talos was a Nord possessed of unmatched tactical skill, limitless wisdom and the power to see into men's hearts. Talos mastered the power of the Voice, and with it he united the lands of men into a great Empire. In southern lands, he was known by the name Tiber Septim. Here in Skyrim, we honor him by his proper Nord name. So great was his reign in life, when he ascended to the heavens he was made lord of the Divines. If you want to know more, I'm sure you can find any number of tomes on the subject." He will also explain why Talos worship was outlawed: "Because the so-called Emperor is a coward! That's right, I said coward! Oh yes! He agreed to banish the worship of Talos at the tip of an Aldmeri sword. They called it the 'White-Gold Concordat.' Well, I call it blasphemy! A true son of the Empire would never have turned his back on our greatest hero, not at any price. Well, let me tell you something, friend. Cyrodiil is a long way from here, and in Skyrim, we will never forsake mighty Talos!" If Whiterun is either neutral or under control of the Imperials, you can ask Heimskr if he's worried he'll be arrested, to which he'll reply, "Let them come! I have no fear, for Talos is my ally and I am his prophet. His word is upon my lips, his voice in my throat." If Whiterun is instead taken over by the Stormcloaks, you can only ask him if the Imperials tried to arrest him. He'll reply, "Oh yes, many times. But mighty Talos was my keeper, my shield against the heresy of the south! If not for Talos, and a few modest bribes paid to the right jailors, why, I would not be standing before you today, resplendent in my faith!" If Whiterun is controlled by the Stormcloaks, Heimskr will have an additional greeting: "Praise Talos and all the Divines! Whiterun has been liberated by the true sons of Skyrim!" You can mention to him, "No doubt you welcomed the Stormcloaks with open arms. ", to which he'll add, "With open arms, with cheers and song, with joy in my heart and tears in my eyes! Praise be to Talos, this is a glorious day for Whiterun and for all Skyrim! Our liberators have come at last!" However, not everyone appreciates his fervent devotion, as Brenuin will sometimes complain about him: "That Heimskr's crazy. Him and his talk o' Talos. Wish he'd just shut up." If Whiterun is under Stormcloak control, Jarl Vignar Gray-Mane will also mention Heimskr as he speaks of restoring Talos worship: "Aye, with a certainty. It was Talos that helped us win back the city. I'm as sure of that as the sun rising in the morning. Might even build a new temple and put Heimskr in charge of it. Hah! I bet he'd like that." "Talos the mighty! Talos the unerring! Talos the unassailable! To you we give praise! We are but maggots, writhing in the filth of our own corruption! While you have ascended from the dung of mortality, and now walk among the stars!" "But you were once man! Aye! And as man, you said, 'Let me show you the power of Talos Stormcrown, born of the North, where my breath is long winter.' 'I breathe now, in royalty, and reshape this land which is mine. I do this for you, Red Legions, for I love you.nb1 Aye, love. Love! Even as man, great Talos cherished us. For he saw in us, in each of us, the future of Skyrim! The future of Tamriel! And there it is, friends! The ugly truth! We are the children of man! Talos is the true god of man! Ascended from flesh, to rule the realm of spirit! The very idea is inconceivable to our Elven overlords! Sharing the heavens with us? With man? Ha! They can barely tolerate our presence on earth! Today, they take away your faith. But what of tomorrow? What then? Do the elves take your homes? Your businesses? Your children? Your very lives? And what does the Empire do? Nothing! Nay, worse than nothing! The Imperial machine enforces the will of the Thalmor! Against its own people! So rise up! Rise up, children of the Empire! Rise up, Stormcloaks! Embrace the word of mighty Talos, he who is both man and Divine!" "Trust in me, Whiterun! Trust in Heimskr! For I am the chosen of Talos! I alone have been anointed by the Ninth to spread his holy word!" After the Battle for Whiterun (Imperial or Stormcloaks), Heimskr's house will be destroyed. If you sided with the Imperials, Heimskr will be sent to jail, where he will continue preaching his sermon. Otherwise, he will set up camp atop the retaining wall next to his shrine. The ESO book Subtropical Cyrodiil: A Speculation seems to suggest that Heimskr is a title rather than a name. nb1This quote is a direct reference to the text From The Many-Headed Talos, where it's explained how Tiber Septim transformed the landscape of Cyrodiil from a vast jungle into a temperate climate. Sometimes, if the Imperials take control of Whiterun during the Civil War, Heimskr will not be jailed. Additionally he will leave his cell if jailed and continue to preach. If you first enter Whiterun between 8pm and 5am, and stay outside until 5am, Heimskr would walk to the shrine but never preach. This would persist for the rest of the game. This issue has been addressed by version 2.0.7 of the Unofficial Skyrim Patch; two fixes have been attempted but there are persistent reports of this still occurring. If you kill Heimskr before Battle of Whiterun, upon finishing the quest his long since vanished dead body will be placed in front of Warmaiden's and will never disappear. ?